Every dozen years the Topzwellers poked their heads through the loamy soil near the entrance to the baseball park. As Liane had turned 12 during the last phase, it was her first time as lookout. Nervously, she looked to her left which caused her left eyeball to pop out of her head. It was like a turn signal or if she wasn’t moving, like a zoom lens. When she saw that the target was already in place and all systems were GO, her little arms locked into the straight position, fingers splayed, and her underbelly turned yellow. Keeping her position trained on the target, Liane gingerly touched each of the others with her tail, a signal that they could emerge. She knew that when they were all in position, this would be the greatest night of her life. ... and then what happened - did it all go to plan???? Was it the greatest day of her life?? Can't wait to hear, Darnell. What a fun and slightly other-worldly card too. Nice, that she has shown herself again and after such a long time, you can not be too careful. Sweet story and great designed card. Fabulous card, love the story...but NEED to know what happens next..! Great story and amazing illustration. So I also need to know what happened next. When and where can I purchase the book? Eeep! You left us hanging on pins and needles here!! So cute!!!! If someone came along and chopped those up and cooked them with their steak my teddy bear is not going to be happy. Are they at the World Series game and who is playing? What is Liane leading her Topzwellers to do? When will we find out? What happens on the greatest night of her life? Next chapter, please. The picture captures the story or vice versa. Great job ladies. Can't wait to hear the rest and that illustrations if fabulous! Loving this new series you ladies have created! Love the story with your very cute card. 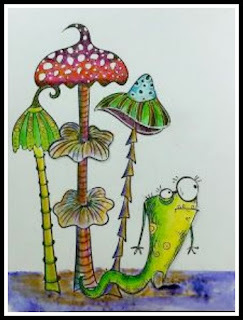 I love Edgar( I named him, hope you don’t mind) is right to be cautious and being near mushrooms is a good idea. Love the colours and how you created the images. You two make an amazing team. What a fun design and story. Keep it going as I love this! You really need to write a book, girl. Cornelia could illustrate...what a best seller it would become. Well, you've got me hooked into the story, Darnell!!! Very creative! I get such a kick out of your stories with Cornelia's illustrations, Darnell. Can't wait to you do a whole book!! Loving the story - and the design to go with is so appropriate. Anxious to read what is next. Too fun!! What a hoot...I agree, you two should do a book about Liane. Hugs to you, Darnell. What fun, a really super card with super fun images and gorgeous colours, great storty too. Sorry Darnell, I can't not remember if I have thanked you for our lovely card, it was really super and thank you so very much. You and Cornelia should put together a book, my friend! BTW, thanks for the beautiful Spring card. If it keeps raining I'm going to need to find a pair of boots like this, except a little bigger! mwah! That Liane is a daring one! 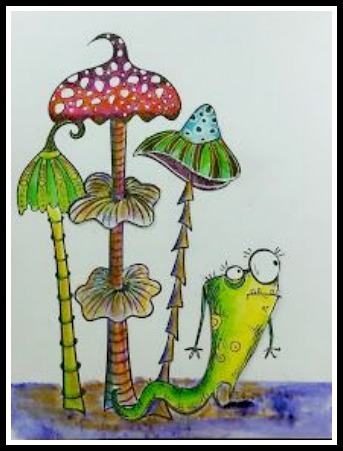 While she does have her own brand of super powers (that popping eyeball, for example), she still needs to be mindful of the mushrooms that grow in the woods. While beautiful to look at, they can be deadly. Oh, stop! This was hilarious, Darnell! I know Rich wonders what could be so funny about a stamping blog... I laughed out loud. Tee hee hee hee! I adore this set of images ... and the cute story is something else!! Amazing! Love it. Truly Wonderful. Keep them coming. I can' wait until the book comes out. What a fabulous combination...you an amazing story teller and Cornelia a fabulous colorist. Love this series. Love this little cliff hangar! You all are quite the creative pair! Wonderful story and adorable featured star--she's adorable! !